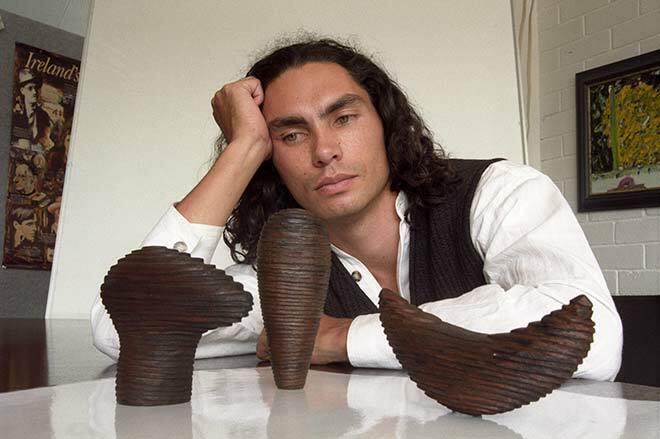 Brett Graham contemplates small wooden models for his large granite work 'Kaiwhakatere – the navigator' (2000). The winner of a competition by the Wellington Sculpture Trust, 'Kaiwhakatere' was erected on a site in Bowen Street formerly occupied by Broadcasting House. The shapes represent a bird that guides the travellers to their destination, the canoe in which they travel, and the altar they build in the new land as a focus for their future hopes. Like many of Graham's works, the simple forms have surface projections and recesses to create sculptural interest.